Mudra. … (Sanskrit “seal”, “mark”or “gesture”; Tibetan: chakgya) is a symbolic or ritual gesture in Hinduism and Buddhism. Most mudras are performed with the hands and fingers. Each mudra communicates both to the person who performs it and to the observer, aspects of a particular state of mind. The most notable mudras are; an open palm pointed downward signifies generosity; hands folded in the lap signify meditation; a palm held up facing outward signifies the act of teaching or reassurance; palms together in the anjeli position mean greeting. Motherhood is central to the conception of Tara”. Her titles include “loving mother”, “supreme mother”, “mother of the world”, “universal mother” and “mother of all Buddhas”. In Tibetan symbolism, green is considered to be the colour that contains all other colours, while white is the pure non-colour from which all colours have their origin. Tara means Star. A secondary meaning is “Saviour” meaning “She who carries us across the waters”. 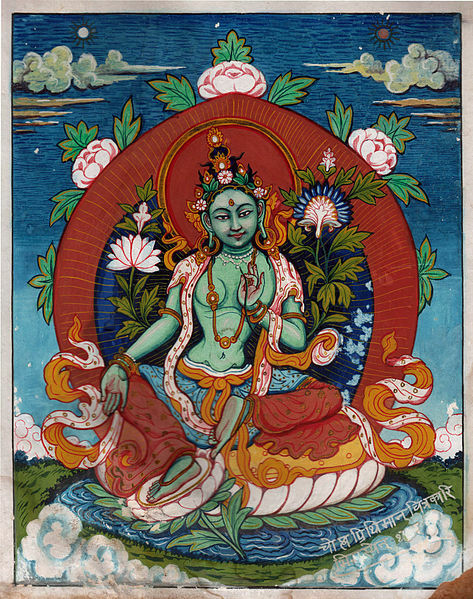 The waters are the waves of samsara.